President Buhari approves N164m for Chibok girls fees in AUN – Royal Times of Nigeria. 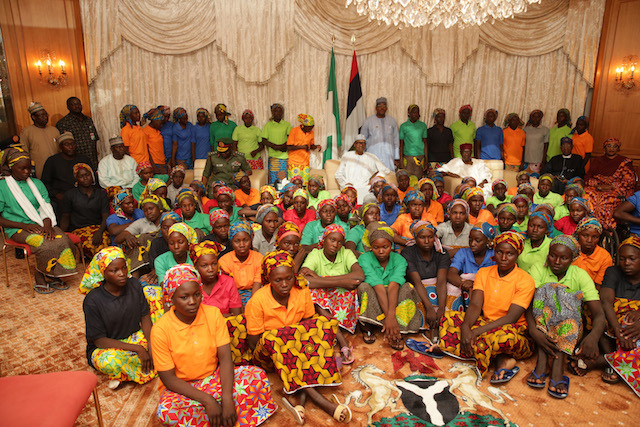 President Muhammadu Buhari has approved the payment of N164,763,759 as school fees of the freed 106 Chibok girls studying at the American University of Nigeria (AUN), Yola, Adamawa. The Garba Shehu said the money is for the second-semester fees of the girls. The statement read,“Having successfully achieved the desired goals of the rehabilitation and reintegration programme, with recorded significant improvement in the academic performance of the girls, in September, a final send-off party was organised for the 106 Chibok girls and they were subsequently moved to the American University of Nigeria (AUN) in Yola for their foundation studies and continuation of their education,”. “The AUN had successfully established a foundation school for 14 out of the 57 Chibok girls who escaped while the rest of their classmates were taken to the Sambisa forest by Boko Haram. “The absorption of the 106 girls into the school marked the beginning of their integration into the larger Nigerian society, thus fulfilling president Buhari’s promise of providing the best education for them.